Gilmore (ankle) is active for Sunday's game versus the Dolphins, Zack Cox of NESN.com reports. 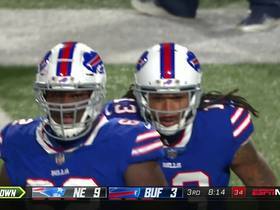 Analysis: According to Michael Giardi of NFL Network, Gilmore still doesn't look fully healthy. 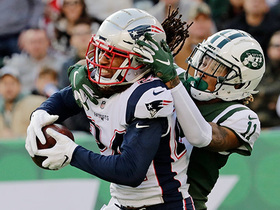 The Dolphins passing attack is anything but threatening, so it's reasonable that the Patriots may restrict Gilmore's reps since they want to ensure their top cornerback is healthy when the playoffs arrive. Gilmore (ankle), who is listed as questionable for Sunday's game against the Dolphins, is viewed as a game-time decision, Ian Rapoport of NFL Network reports. 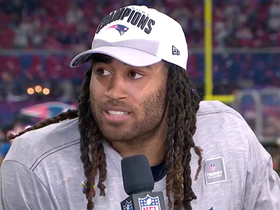 Analysis: If Gilmore fights through the ankle issue and suits up, he'll likely be playing at less-than-optimal health, as he appeared to be moving slowly while getting off the Patriots' team bus Sunday, per Michael Giardi of NFL Network. Gilmore has proven his worth as the Patriots' top cornerback this season, but it hasn't translated to much IDP utility. He's racked up 37 tackles, 15 pass breakups, two interceptions, two forced fumbles and a sack through 12 contests. Gilmore was added to the Patriots' injury report Friday with an ankle issue and is listed as questionable for Sunday's game in Miami, Mike Reiss of ESPN.com reports. Analysis: While a late addition to the injury report is usually concerning, Gilmore still managed a limited practice Friday. Given how the Patriots tend to guard injury information, confirmation on his status may have to wait until the team's inactive list is released at approximately 11:30 AM ET on Sunday. With Gilmore well established among the elite at his position, an absence would be a positive development for the Week 14 outlooks of Ryan Tannehill, DeVante Parker and Kenny Stills. Gilmore recorded a tackle and an interception during Sunday's 27-13 over the Jets. 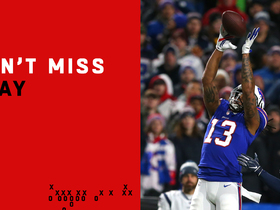 Analysis: Gilmore earned his second interception of the year in a crucial moment when he picked off Josh McCown on the goal line in the fourth quarter. The pass was intended for Robby Anderson, but Gilmore was able to win the jump ball and come down with the pick. He and the rest of New England's defense will look to stop the Vikings in Week 13. Gilmore posted four tackles (all solo), including a sack, and a forced fumble in Sunday's loss to the Titans. 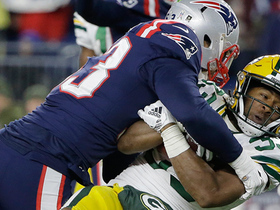 Analysis: Gilmore's sack Sunday was the first of his career. 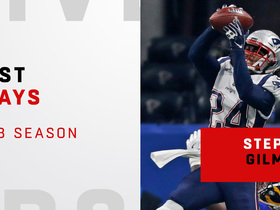 He's having another quality season for the Patriots and has been the team's top cover corner. Looking ahead, the Patriots have a Week 11 bye before taking on the Jets in Week 12. 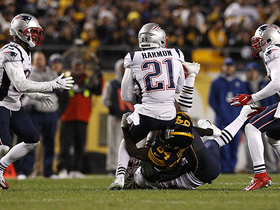 New England Patriots cornerback Duron Harmon comes up with his second interception of Pittsburgh Steelers quarterback Ben Roethlisberger. 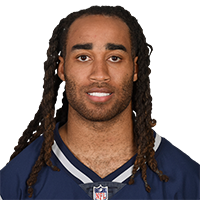 New England Patriots cornerback Stephon Gilmore looks like wide receiver on leaping interception at goal line. 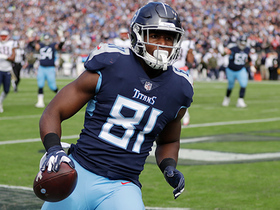 Tennessee Titans tight end Jonnu Smith shreds through arm tackles on this 29-yard gain. The New England Patriots pop ball loose from Green Bay Packers running back Aaron Jones' arms. 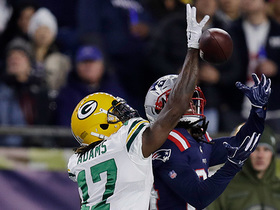 New England Patriots defensive back Stephon Gilmore breaks up pass to Green Bay Packers wide receiver DaVante Adams in the end zone. 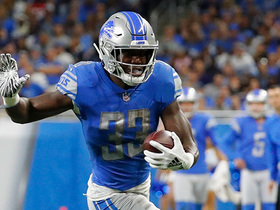 Detroit Lions running back Kerryon Johnson ends Lions' 70-game drought without 100-yard rusher.